Wednesday, the sun is shining it is warm. Neal is checking the weather often, worried that the second half of his team will be snow bound in Boston or delayed and caught in Istanbul. I have traveled with this man for many years – he is amazing, and cares very much about doing good and keeping his people safe. He is a good man. Though he would quickly respond by saying “there is only one good man, and its not me” – then chuckle. 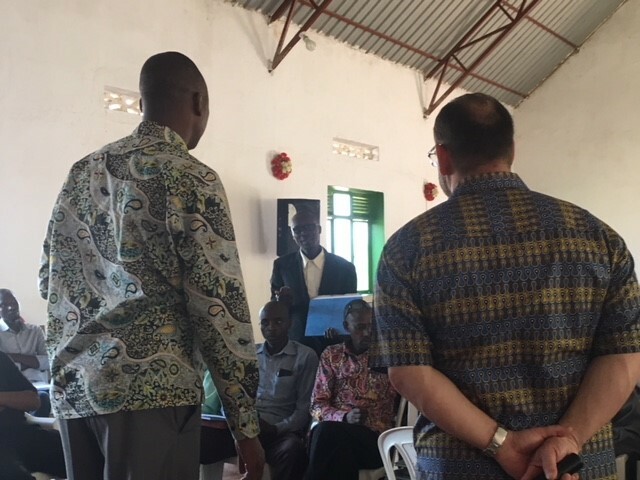 We teach the pastors in a church that was built from a donation from Hope Chapel, made possible from our 10th anniversary “Recycle the Blessing” pledge. The money built the Zarephath church, and they have been making payments to a revolving credit fund – this money in turn is used to put on roofs, windows and eventually build multiple churches. This is a very nice structure – improving every year. To give a glimpse of a teaching, here our translator and Pastor Neal are answering questions, and there are a lot of questions. Each day we start by asking the 56 pastors about the blessings the have seen this year. Today we learned about additional churches that have been built, several receiving funds to put on roofs from the revolving credit, described above. Lots of baptisms. And many pastors share what they have learned – with other pastors in their rural areas, spreading the blessing. These pastors truly have grown a great deal in understanding and confidence! The church puts these very formal high back chairs in the front of the church for Pastor Neal, the translator Steven and I to sit in. Neal and I feel pretty silly sitting in these chairs. So, as we walk in, we grab white plastic chairs (the same chairs used by everyone else) from a stack along the wall to take these to the front of the room. Well this time, it seemed that the window was open and there was a puddle on the top chair. Neal was leading the team – he took down the chair and received a bath. The crowd laughed and laughed. Neal is very good natured – he just turned and said: “now I have been baptized in three countries; in the Jordan River, America and now Rwanda. There are a number of deep questions, but somehow when it is time to write the blog, your mind wanders to the more off the wall questions – all asked with sincerity. Today we taught about the Israelites crossing the Red Sea. The pastors asked; how deep was the Red See; how did the invalids get down and up the banks? We had to check if Pharaoh died with his troops – looks like he did. After teaching we took our first stroll into the marketplace. Vendors have come to recognize us. Pastor, Pastor, come to my….. We tell them, “we will be back”. It is a fun break before heading home – to read and prepare for the next day. We have completed the 10 Plagues, the next big thing to tackle is the 10 Commandments and the Law. Not much of a storyline for these – so we are still tossing back and forth how best to present to the pastors. As you know, Neal works hard to make his messages relevant to the people, it takes extra finesse with cultural differences. We will have this done before long. We are anxious to see our wives and more of the team. You guys are such a blessing – praying for you all. Stay healthy. May the Lord give you utterance and simplicity to present the gospel. May He open the understanding of the pastors to comprehend the teaching in Jesus’ name!Amen. God bless you richly#Heb 6:10. We are loving the detailed posts! It’s so nice to get a glimpse into what you are experiencing. May God continue to bless you all! Praying for a safe and uneventful arrival for Christina, Peggy, and the rest of the Good Rain team!